Currently if you add an icon to a sidebar, it's shown in the dropdown for the sidebar button (where there are no other icons). 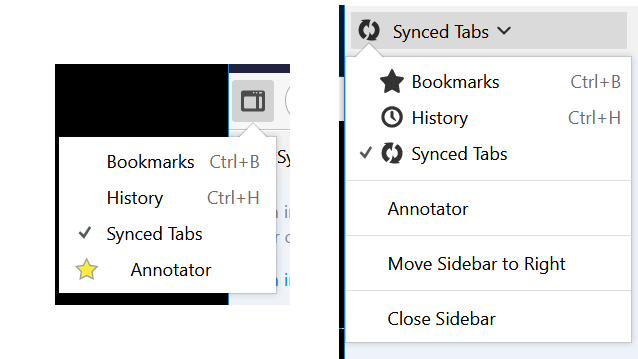 If you then open the sidebar and click the title, you'll see a dropdown where Firefox shows icons for Bookmarks/History/Synced Tabs, but the WebExtension sidebar does not have an icon. We should match Firefox in both cases. The toolbarbutton above will loose the dropdown, but the icon shouldn't be missing from the menu in the sidebar titlebar. In my latest nightly, the button has no icon. The sidebar menu that photon adds has an icon. All looks consistent and nice to me. I'm not seeing the sidebar icon anywhere at all with the example sidebar extension on latest Nightly. Could this please be reopened? Sure, it was there a couple of days ago, now it is gone. I'd guess this is related to all the photon changes. Can someone check if this is working in 55 beta, and, if not, set the relevant release tracking flags? Works in beta 55. Couldn't reproduce with or without the photon tracking flag. I can't reproduce on OS X when loading the manifest.json for annotate-page from https://github.com/mdn/webextensions-examples (which I assume is what folks mean by 'example add-on'?) as a temporary add-on from about:debugging in today's nightly. Can someone provide more detailed STR? Is this Windows- or Linux-specific, or does it only happen after a restart, or ...? This looks great! I would recommend using the default icon color (see Bookmarks/History/Synced Tabs) when we use the add-ons icon and not the custom icon. We want a little more stuff here, to handle the case where we don't have an icon, and use the default one. Clearing review for now given the self-review. I expect you should be able to use a popupshowing listener on the popup (`#sidebarMenu-popup`) to attach when the popup is being shown rather than when it is built? Out of curiosity, why remove this? I rather expect it should be kept, so that webextensions that ship a 32x16px (or 16x32px) icon still end up with a 'square' slot for their icon. > Out of curiosity, why remove this? I rather expect it should be kept, so that webextensions that ship a 32x16px (or 16x32px) icon still end up with a 'square' slot for their icon. Without this, there's no space for the checkmark beside the icon. Perhaps there's a better way to do that, by adding a margin for the checkmark instead of padding? I'll look into it. Fantastic, A++, would review again. Hey Gijs, can you clarify the STR for this? > Hey Gijs, can you clarify the STR for this? Verified on Windows 10 64bit, Mac OS X 10.11, Ubuntu 16.04 64bit using Nightly 58.0a1 (64-bit) as of this date. Verified fixed on 57 Beta 6 (20171005195903) by following the STR from comment 24. Tested on Windows 10 x64, Mac OS X 10.11 and Ubuntu 16.04 x64.